Dholak - J A Y A D E V I Arts Inc. - "Preserving IndoCaribbean Arts & Culture"
The Dholak is a hand drum which is also popularly known as dholaki. Dholak is a classical North Indian percussion instrument. A dholak may either have traditional lacing or turnbuckle tuning. While the Dholak has a simple membrane and a handle on it’s right side it’s left-hand membrane has a special coating on the inner surface. This coating is made up of a mixture of sand, tar, and clay also popularly known as thedholak masala, which not only helps in lowering the pitch but also provides a fine tuned and well-defined pitch. The shell of the Dholak or the drum shell is usually made from sheesham wood. The results of the finished process of hollowing out the drum determines the tone quality of a dholak. The resultant shape and the surface of the Dholak’s interior, whether left rough-hewn by a drum carver or carefully smoothed decides the quality and kind of sound ti will produce and a lot depends upon this aspect of Dholak. Because basicaly Dholak is about rythem, Sound and quality of sound and pitch that it can provide . The Dholak with high-pitch head is played using a typical thin, around say, 1/4"/6 mm or less in length stick of solid rattan or hardwood. The Rattan is preferred for the flexibility it provides. The low-pitched drum head is generally played either by hand or by using a somewhat thicker, semi-angled stick which roughly measures the dimension and shape of a small hockey stick. Dholak masters are often adapt to singing or chanting and may also often provide a primary entertainment or lead drumming for a dance troupe, this especially happens in Punjabi bhangra tradition, which is there traditional folk dance. Many modern dhols these days use a thin polyester plastic modern snare drum head for the high-pitched head. 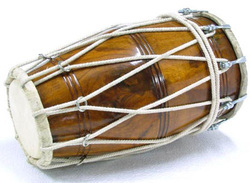 A dholak has 2 drum heads: a smaller one for the high pitch, and the large part is for the low pitch and it is pitched depending on size and tuning sounding just like the Bongo in playing mode. Traditionally, some players use hand playing on one or both drum heads stylistically which is similar to what happens in tabla recitals. However, in the recent times in Indian Punjabi folkloric dance music called bhangra, the dhol plays a key role in giving the music its famous authentic bhangra spirit with a peppy touch. Dholak: The dholak is also often used in Indian cinema, that mostly focuses and concetrnates on light and popular genre of music. Dholak is also used extensively in baithak gana, and tan singing – which is the local Indian music of the Caribbean. Dholak here is the main instrument along with the harmonium. In the Fiji Islands, the dholak is very popular and widely used for singing bhajans and kirtans which mean the same thing as the hyms. Dholak is also very popular duing Indian weddings in most states. In majority of the Indian communities, young adults and children sing and dance to the beat of the dholak. The dholak provides an interesting accompaniment for the fast paced and peppy lyrics of wedding songs aimed at an abashed groom and bride-to-be along with the two new families coming together. At weddings and religious gatherings, women beat the dholak to produce the sound and rhythm and sing. No auspicious occasion is complete without songs sung to the accompaniment of this instrument in India. It's a common sight where one woman is beating the dholak and another striking the body of the drum with a spoon to add to the music. Sometimes the drum is also decorated with tassels. North Indian Dholak is very popular and smaller in size than the one used in other regions. It is played with both the hands and sometimes also with the figner ring worn on the right thumb. It helps to keep up with the beat and produce an additional sound for adding creating variety. A bigger variety of the Dhol is the Dhak, which is used in Bengal during the puja ceremonies. But the dhak is played with the help of two long and thin sticks. Learning Dholak is very easy and almost every small and bid city is India has institutes teaching Dholak. They conduct regular classes and after coaching put you through examinations and on passing them you get certificates and even degrees if you pursue it longer. Make sure when you appear for your exams you do them through a nationally recognized university. Dholak workshops are held for groups and individuals, wishing to experience and learn dholak and its drumming techniques, rhythmic patterns etc as short-term courses. Musical Styles that use Dholak are Bhajans, Indian Light Classical Music, Film Songs, Folk Music, Geet, Qawalli, Kirtan Dhun and Shabad. The Dholak made of Wood. Size: length 16 inches, oneside-8 inches, other side-6 inches Handmade by wood craftsmen and can be shipped in 48 hours after receiving the order. The dholak is nothing more than the smaller, feminine version of the dhol. It is generally approximately about 35 cm long, with its heads measuring 20 cm in diameter. It weighs about 11.02 pounds. Dholak is a very popular folk drum of northern India. It is barrel shaped Indian Percussion Instrument with a simple membrane on the right hand side. It is nothing but a smaller version of the dhol. The left hand is also a single membrane with a special application on the inner surface. This application is a mixture of tar, clay and sand called dholak masala which lowers the pitch and provides a well defined tone. There are two ways of tightening the dholak. Sometimes they are laced with rope, in which case, a series of metal rings are pulled to tighten the instrument. Sometimes metal turnbuckles are employed. It is said that this instrument used to occupy a position of considerable prestige. Today it is merely relegated to Indian film and folk music.